Snakes&Funerals (colour, 14 mins, 2012) was made as part of Queer, The Space, a project that ran between September 2011 and May 2012. Inspired by the work of such queer theorists as Sara Ahmed and Judith Halberstam, (1) Queer, The Space brought together artists, academics, activists, performers and writers in one space, the Centre for Creative Collaboration (c4cc) in London, to engage with questions of spatiality and orientation. 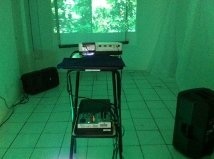 The resulting collaborative works took the form of text, image, sound, performance, and a combination of these forms. (2) They were presented to the public at a showcasethat took place on 24th May 24, 2012. Taking Jean-Luc Godard’s canonic film Le Mépris / Contempt (1963) as a starting-point, Snakes&Funerals set out to explore the queer possibilities of image and sound, especially of colour and of ‘straight’ repetition. Sound and image were developed separately and then brought together in an encounter between and across languages, landscapes, cultures, aesthetics – an encounter characterised by chance, indeterminacy and a refusal of the ‘natural’ and the ‘logical’. (The title refers to a dismissive comment made early on in Le Mépris by Fritz Lang, playing himself: ‘CinemaScope — it’s only good for snakes and funerals!’) In this queer deconstruction of a work by one of cinema’s most aggressively heterosexual directors, the orchestral theme Camille by Georges Delerue (the pathos of which Godard never took seriously) meets a Finnish folk song (The sky is blue and white, sung by Emily Jeremiah), (3) ground supplants figure, and the fatal narrative and noise of the modern couple is propelled into a new kind of silence and void. The film of Snakes&Funerals formed part of a continuous loop for an installation that occupied an entire room of the c4cc. (4) The two images below emphasise the immersive nature of this site-specific work, as well as its deframing of the standard set-up of projection. 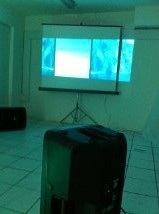 With the screen positioned at an angle, the projected image exceeds its assigned place and frontality and seeps into the surrounding white space peopled by outsize speakers. (2) The project, co-organised by Sarah Barnsley (Goldsmiths, University of London) and Emily Jeremiah (Royal Holloway, University of London), was funded by The Culture Capital Exchange. Further details of the project can be found online at http://www.queerthespace.org/, which comprises an archive of the May showcase. Snakes&Funerals is also archived online at http://www.youtube.com/user/GLLNWYDE?feature=mhee. (4) Thanks to John Walsh, Helen Pritchard and Damien Sanville for their technical assistance.